OET’s team of experienced marine scientists has been involved in a wide variety of marina permitting and coastal engineering projects in the U.S. and abroad. We incorporate state-of-the-art oceanographic instruments to measure current directions and speeds, water quality, bathymetry, and geologic characteristics of specific coastal environments for site development and habitat construction/conversion. These data sets are often used in conjunction with detailed computer hydrodynamic modeling to predict the impact of development on coastal hydrodynamics. 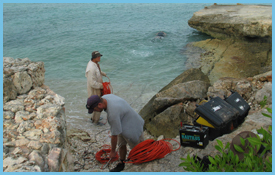 Additionally, OET provides detailed surveys of near-shore environments, including sea-grass surveys, wetland delineations, and coastal sediment mapping.